Video editors have taken a short time to develop the multi-functional software they are today. The complexity of many editors is enough to scare many people. According to statistics, the hefty price tags attached to some of the software are what it takes to make people give up on video editing software. However, there is no need to shy away; you can choose from a wide range of free software that has professional audio editing features with a user-friendly interface you can learn. Whether you are looking for a software to help you create a video for your work projects, birthday or funeral video tributes, to convert old video formats into the latest formats you can play using modern devices while enhancing video quality and removing background static noise; then KdenLive is the software for you. In this guide, we not only give a review of the KdenLive software, but we also explore why it is the better choice compared to other video editing software especially the paid ones. Its sheer power makes it one of the best video editing software for download today. KdenLive is one of the popular non-linear video editing software. 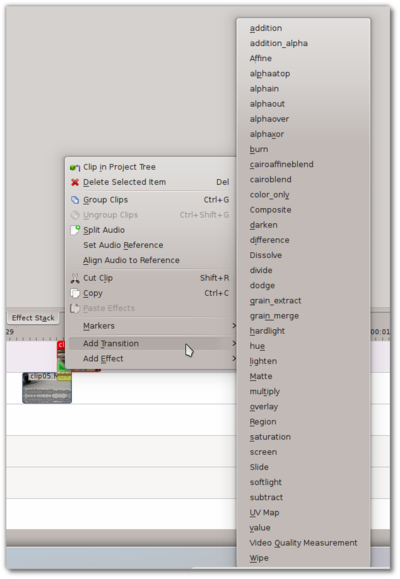 It is an easy to use open-source editor, and you do not have to pay a dime for it. It is a huge hit with beginner video editors, and it has hundreds of armatures into professional video editors with a business that turn a profit in upwards of a million dollars a year. The software is based on the MLT framework, Qt, and KDE. The software is free for Mac, FreeBSD, Mac, and more recently Windows operating systems. You can access the sources code under the rules and regulations stipulated by GNU General Public License with version 2 being the minimum. It is one of the most downloaded video editors topping more than 50 million downloads. KdenLive is the brainchild of Jason Wood in 2002. However, a small team of developers maintains the software Wood released version 2. Development of the third version was done on the KDE Platform 4, and the developers rewrote huge percentage of the source code. The earlier versions were developed on the K Desktop Environment 3. The team was to later complete with KdenLive 0.7 and launched on November 12, 2008, and the last of the K Desktop Entertainment Platform 4 versions was released on the first if October 2014. KDE Frameworks 5 port was finished with the launch happening a year later. The latest version is 17.04 for windows and 17.04.2 for Linux released on June 9, 2017. 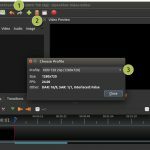 This open-source software provides that user with similar basic video editing features except for a few premium features. Despite this, KdenLive has continued to gain in popularity because of its easy download options. The new version 17.04 Win 64 bit installation kit is portable, and this makes it easy to edit videos from any device in the world. The developers have one aim, and that is to provide basic video editing features extending to professional work. It relies on several open sources projects such as the MLT framework as well as FFmpeg. In addition to the platforms mentioned above, KdenLive also makes use of LADSPA libraries, FreiOr effects, and SoX. The software also supports all the video formats supported by libav or FFmpeg including AVI, MPEG, QuickTime, WMV, Flash Video, Mp4, 3Gp, among others. The features below make KdenLive the better choice when you are shopping for video editing software. It has one of the best multi-track editing with a timeline and while in batch mode, it supports an unlimited number of videos and sound tracks. It has a wide range of effects and video transitions. You get a wide list of effects such as options for distortion, clip rotations, color adjustment tools, blue-screen, and masking, among others. Audio Effects include phase and pitch shifting, volume adjustment, normalization, equalization, and reverb filters, and so much more. The software includes tools to help you create, crop, move, as well as the ability to delete the video and audio clips, text as well as photo clips. This is possible through the easy to use interface layout and configuration keyboard shortcuts. Fast rendering speed and rendering is done with the help of separate non-blocking process; this means you can update the video in real time with the ability to restart, pause, or stop the video project. Professionals have hailed KdenLive for the ability they get when editing projects and they can add custom transitions and effect with ease. This script has helped KdenLive to get all the popularity. KBW compiles all the latest developer versions of the software and its accompaniments from the source. This allows KdenLive users to use and test new features as soon as they are released and they can report the problems on the accompanying bug tracker. The installation process on all the four operating systems is easy, and it does not take a genius to have it up and running. It does not take long hours of practice to get your head around the software. Let us look at how to use it to create amazing professional looking videos. After installing the latest KdenLive software version and open it, you find that you find the all familiar interface that is divided into several sections. The interface has a responsive design, and this allows you to add, remove, and add sections you want to work with to give the desired result. If you are new to video editing, KdenLive it will be pleasing to know that you can make as many video and audio tracks as possible without paying a dime. KdenLive tops the list with the easy navigation of the interface, and you simply click on New, at the top left-hand corner of the screen, you then have to set the project profile and folder. You can select either of the several preset profiles to suit your editing needs. Sometimes when editing videos, you cannot risk having distractions on your screen, and it is crucial to focus on the section you are often using. You can easily delete some sections to make room for adjusting the resolution of other sections. Just click on the close button on that section, and it will close. Importing video clips, photos, and audio tracks are as easy as dragging and dropping on to the project tree. You can then add it to the video track. Any transitional effects that you add to the video will not reflect on the original file unless you save it without changing the name or the location. However, as a video editor, you will need to do a lot of cutting and trimming video clips to get the desired result. KdenLive makes the job easy and by providing easily accessible tools on the top left-hand corner of the screen. Use the ‘Razor Tool’ or just press ‘X’ on your keyboard for the Razor Tool. Move the mouse pointer on the video track, and it will change into a scissor, and you can proceed to cut the video. Titles are important not only when identifying the videos, but they play a crucial role in directing site traffic from search engines especially if you intend to use the video as a part of your SEO. Right click on the project tree and then click on the Create Title Clip section for the menu that pops up. KdenLive allows you to write and format the title using the basic tools. You can also add a blur effect on the title for an aesthetic appearance to your title. Transitional effects are the blood and soul of a video, and they allow the clips and images to play systematically. KdenLive has many effects and that you can apply to your project in real time. You can check out on the KdenLive page or YouTube by enthusiastic users of the software many tutorial videos. Keep your ears on the ground for new versions that will have an updated list of transitional effects. From experience and that of many other novice video editors, any one, not just the professionals, can use the effects. The above keyboard shortcuts can be a much to comprehend in a single sitting; besides, you are not studying for a test, and you can pace yourself and learn the shortcuts at slowly. For a person starting to use KdenLive for the first time, the interface can be a little intimidating, and it might put you off as a sophisticated software to use. However, KdenLive ranks among the easiest to use interface in a recent online poll. You also get a lot of user support in the form of online community of users, forums, discussions, and tutorial videos on the KdenLive website, YouTube and many other video sharing sites. Through the robust online community of forums and debates, KdenLive has become one of the popular video editing software, with armatures and experienced professionals vouching for it. It has become famous for editing videos for uploading on websites, blogs, YouTube, and social media platforms. Content developers for the KdenLive site used the software to compile their video and audio tracks to come up with a high-quality result. The internet is the biggest source of valuable support for all user questions. As stated above there are existing community forums and discussions that make it easy to understand and get solutions to problems they encounter while using the software. There are also hundreds of pages of articles and other documentations on how to navigate the software from the developers. The team of developers has really gone to expansive lengths to give the best to their users. One thing that makes KdenLive to shine among the piling stack of free video editing software is that you can download title, wipes, and render profile templates from the interface. You also get a flexible theme engine that allows you the capability to change between dark and light themes for your copy of the software. 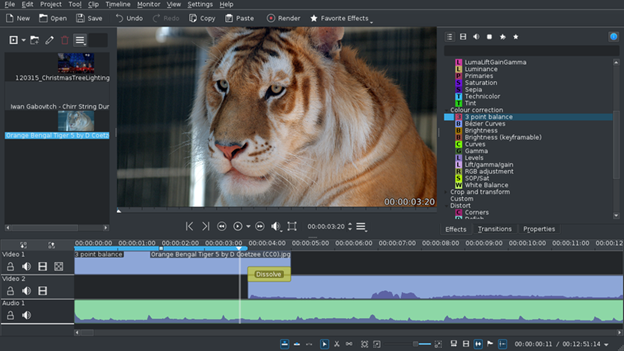 KdenLive is a composite video editing software that gives users the ability to do a range of edits to a video such as trimming, joining, copying, and adding transitional effects to different clips and images among others.